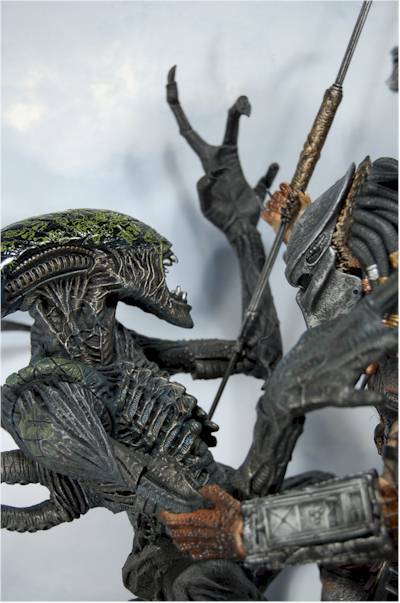 A few reviews ago, we looked at the new 12" Grid Alien from Mcfarlane Toys, based on the film Alien vs Predator. 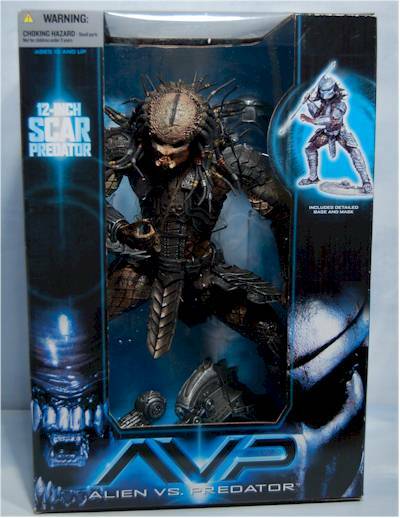 Tonight we check out his bro, the 12" Scar Predator. 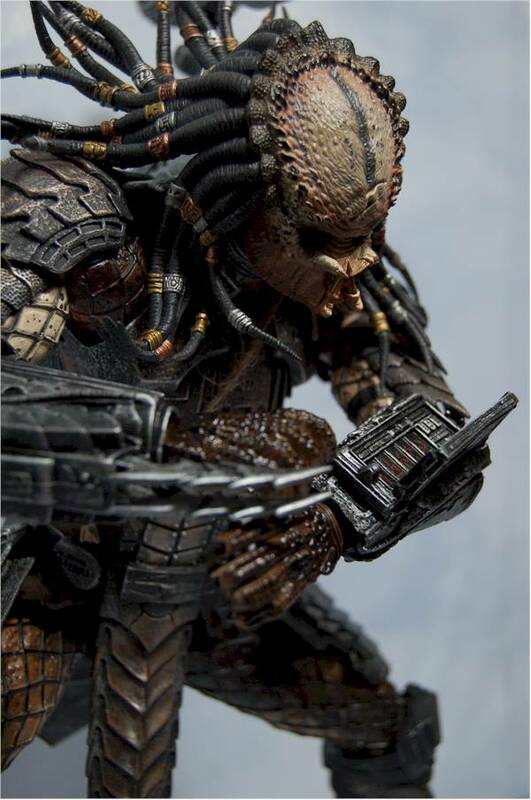 While the Grid Alien hasn't shown up quite yet (should be in stock any day at some stores), this Predator is on some shelves. Expect to pay around $30, and don't forget to check out the suggestions I have at the end. Remember, the sponsors make the site possible these days! Just like the Alien, the Predator comes in a nice big box. He looks a little better in the box, since the pose allows for him to be a bit more confined and still look reasonable. This is not friendly packaging though, collector or otherwise. It's a hell of twisties, and I'd suggest breaking out the wire snips. Interestingly enough, the sculpt and paint scores on this figure are exactly opposite of the Grid Alien. Part of the reason for the better sculpting score is the better pose. While he's still in a bit of a squat, it's closer to a reasonable fighting stance for a two legged opponent. The figure also sports enough articulation to make the pose work in more ways than the Alien. This is a Mcfarlane product, so you can certainly expect tons of small detail. The work on the face and 'head plate' is particularly amazing, although this design is not my favorite. That's not really an issue of sculpt as much as the film designs though. I'm not fond of the small mandibles, and the style of the mask isn't my favorite. Those are nits though that fans of this film won't have. All three of them. One issue with the sculpt that more folks might share is the dreads. The hair in back is sculpted from fairly stiff plastic, and sticks upward at an awkward angle. They should lay across the back, and the weird angle doesn't match up with the rest of the sculpt. While this figure is billed as '12 inches', he's actually closer to sixth scale. He stands about 12" in the knee bent pose, but would stand closer to 16" if he was completely upright. What is it with these itty bitty rodent skulls he wears by the way? Who exactly is impressed that he managed to kill a Martian hamster? These skulls are strapped around his torso on a thin rope. The paint ops on the Alien were great, although they weren't quite perfect. 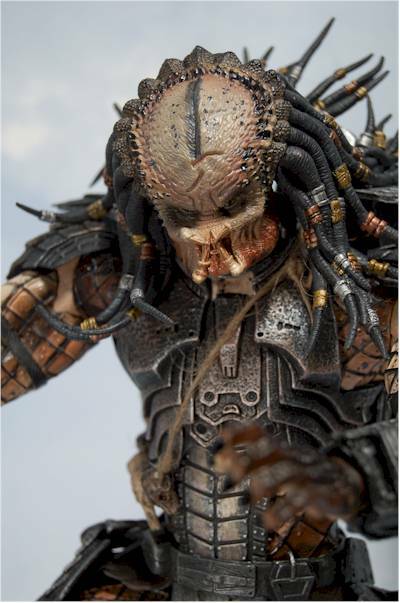 The paint work on the Predator is solid, but some of the shading and finish isn't as realistic. As with the sculpt, the paint work on the head and face is the most impressive. There's lots of detail, and they used a nice combination of gloss for 'wet' areas and matte for skin. The palette is a nice 'realistic' combination of colors there as well. Some of the body work doesn't thrill me quite as much. The darker shades on much of the skin, especially the hands, obliterates much of the sculpt detail, and there's way too much gloss on the hands and inside thighs. However, the weathering and shading of the armor looks great, and while the paint ops aren't perfect overall, they are solid. The Predator has both a better sculpted stance, and better articulation with which to work with. He has a ball jointed neck, although it's not quite as useful as you might imagine since the post is quite short. He also has ball jointed shoulders, the type with joints on both sides of the ball, and the armor is designed to allow a lot of movement with these joints. There's one cut elbow on the left, and a cut right wrist. The left wrists is actually a single pin joint that also turns, giving it much more movement than the usual McToys wrist joint. He has a torso joint and waist, but the movement here is somewhat limited. You can get him twisted slightly to one side though using these, which looks much better with the sculpted leg stance. The leg articulation is limited to cut knees and cut ankles. His last point of articulation is on the right arm, where you can open his control pad. The hinge is quite sturdy in this large of a figure, which is an improvement over the easily broken hinges on the smaller line. 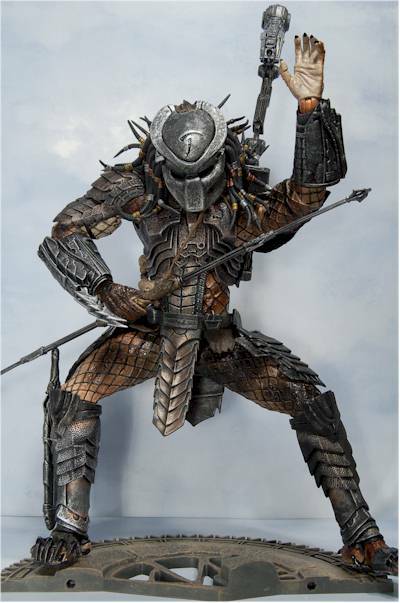 The Predator comes with his removable mask, spear, backpack/gun and stand. The stand works well, and has two pegs for both feet to attach. The stand also lines up with the stand that comes with the Alien to make a complete base, although it's awful tough to have them both on both foot pegs AND get them to stand close. I'm waiting for the first photo with the Alien turned around the other way. The spear is a little small, and doesn't retract or extend in any way. It does fit in his right hand well though. The fit on the backpack and mask isn't as good. The pack fits if you work at it for awhile, but you'll have to get the hair in just the right spot, and be careful of the thin rope around his torso. The gun is articulated at four places - it turns at the very top, and has three pin joints down the arm. While I did get the pack to fit with some effort, the mask gave me fits. It does not snap on and off, but rather sort of hangs there. The fit isn't tight, and I didn't particularly like the appearance when it was on. At thirty bucks, you're getting a pretty average value. He can stand up to most other 12" higher end figures and look good, which takes him a level above the usual 12" plastic figure. If you have kids that love the movie, they'll love this figure. While it might not be the best material for the pre-teen set, the figure is clearly built with enough durability to stand up to play. Not much. Be careful with the thin rope around his torso that contains his 'trophies'. Otherwise, this is a pretty sturdy, well designed toy. Neither of these figures blew me away, since they had enough nits overall. But both do have solid paint and sculpts, and combined they look far better than individually. If you are going to buy only one, the Predator looks better standing on his own than the Alien. The overall pose and style make him a much more flexible display figure. - Killer Toys has him for $30. - Amazing Toyz has him listed at $30 as well. - CornerStoreComics also has him listed at $30. - Alter Ego Comics has this one for $30.31. 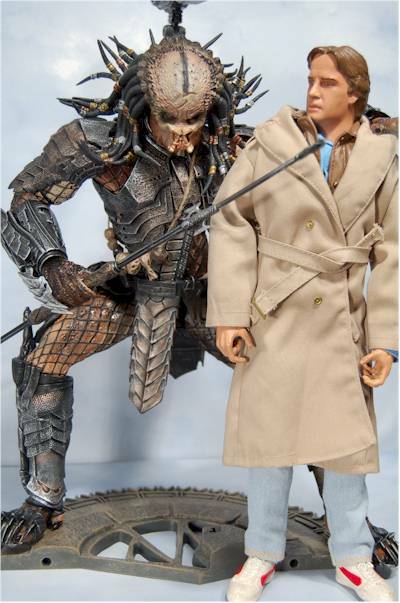 - well, we do have to point out one Alien review, since the 12" Grid Alien goes with him. 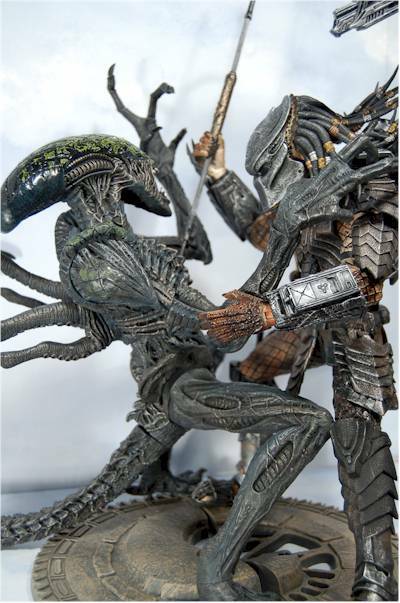 - Mcfarlane also did a Alien and Predator 2 pack before the film, based on the older versions of the characters. 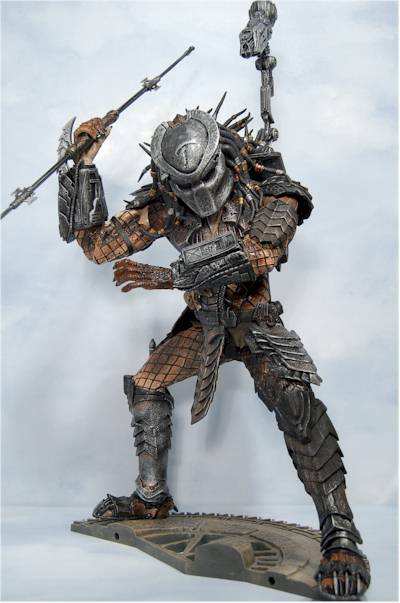 - There have been plenty of Predator mini-busts and statues, including the Celtic Predator. 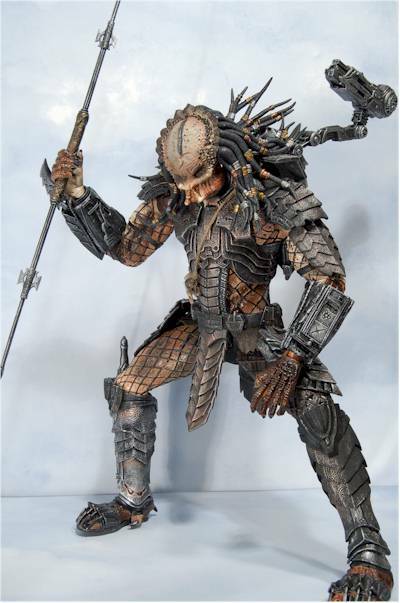 - other busts include the Defeated Predator and Warrior Alien, Defeated Predator, Captive Alien Queen, the special edition Alien, the Elder Predator, and the original Predator. - and if you like them cute, there's always the Predator Mez-itz.